When I was a kid, I always requested the same cake from Mom, a white box cake, with light blue icing and decorated with cherries. It wasn’t that I liked this cake so much, it was that I thought it looked pretty. I loved blue and I loved cherries. Eventually I moved on to dark chocolate box cake with dark chocolate pudding mix added to make it more moist. Mom was probably insulted, since she was an excellent baker of cakes. People beg for her Spice Cake and Apple Cake. And she makes one hell of a cheese cake if you can coax her to do it. In all honesty, cakes just don’t do anything for me, save the cheese cake. I like pies. No, I love pies! And Mom does a heck of a job baking pies too! While you have seen on my blogs a lot of recipes, you rarely see a recipe for sweets, unless I find them incredibly easy and/or incredibly good. I don’t quite know why I have not shared a pie recipe (as Mom did pass this skill on to me. I promise pumpkin pie to you when the season comes!) 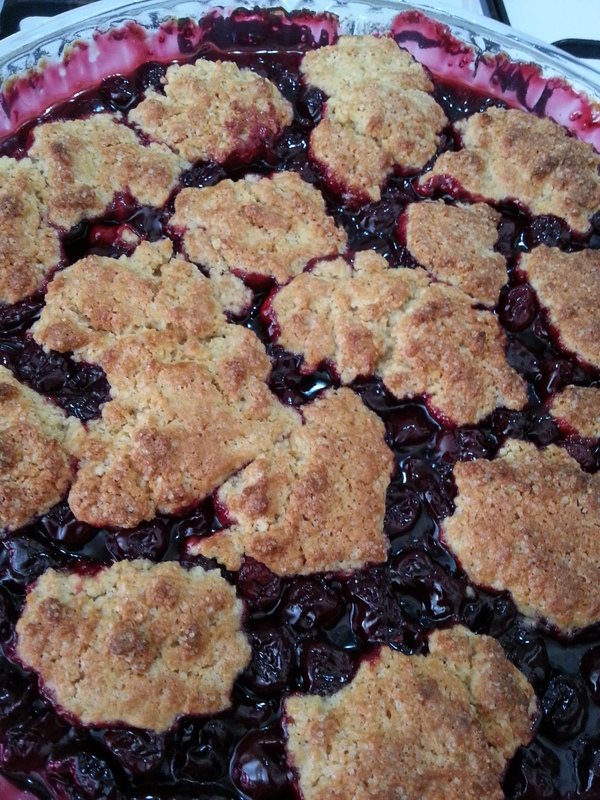 But today, I have decided to share my story and recipes for cherry cobbler. In Turkey, it’s not so easy to buy pitted cherries, much less pitted cherries that are already cooked and jarred. (In fact, I have eaten homemade cherry jam here — with pits!) When I decided to make it for my birthday yesterday, I had to start from scratch. 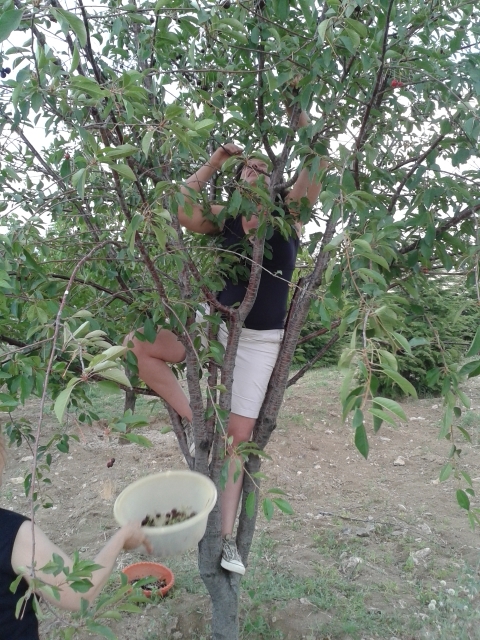 Last week I got the cherries! 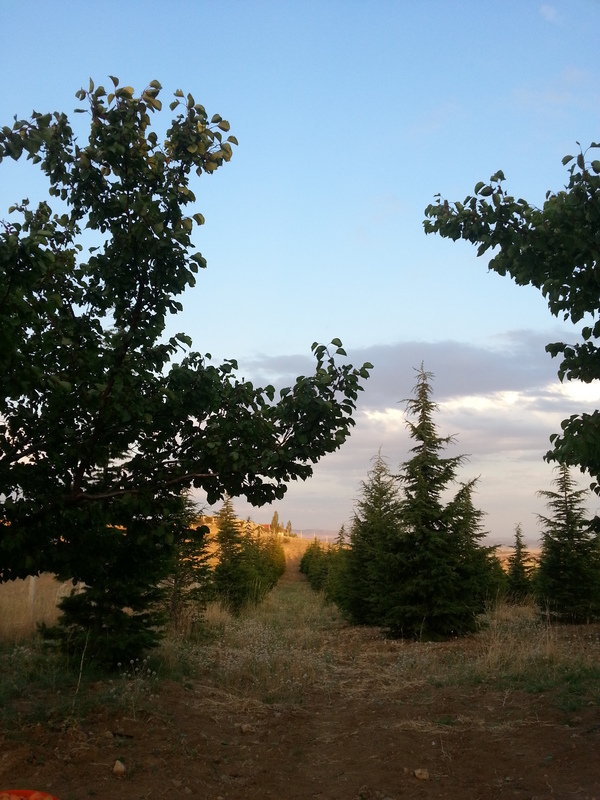 This was taken on a privately-owned piece of land out in the Gölbaşı area of Ankara. What a lovely way to forget your troubles. We spent an afternoon picking fruit, grilling, and relaxing. Of course, pitting is a dreadfully tedious thing to do, and a bit messy. So buy two of these and invite a friend. I invited my husband to the “Pity Party.” Ha ha ha. Yesterday I scoured the internet for a recipe. I found Emeril Lagasse’s and decided, as I always do, to change it just a little. You can click here to see the original recipe. My cherries were sour and I added a little almond extract and orange zest. I also substituted 1/3 of the cornstarch with the same amount of instant tapioca, because that’s what Mom does in her fruit pies. Unfortunately, I brought the tapioca from the States and I don’t think they have it in Turkey. Preheat oven to 400 degrees F (200 C). In a saucepan combine filling ingredients and cook, stirring until bubbling and thickened. Pour into an 8-inch square baking dish. (Round is fine too, but better to have glass so you can see the cherries cooking.) Meanwhile, in a bowl, stir together flour, sugars, baking powder, and cinnamon. Cut in butter until it is crumbly. In another small bowl or cup, mix together egg and milk. Add to flour mixture and toss lightly with a fork just until combined. Drop topping by tablespoonfuls onto filling. Bake for 25 minutes until browned and bubbly. 1tsp (teaspoon) is about the size of a Çay spoon. I find the Turkish convection ovens do not get hot enough on the regular oven setting, I always have to use the fan. If you have this issue too, watch the timing! It only took 19 minutes in my oven. Good luck! I forgot to add that everyone loves it served with vanilla ice cream — except me. What does the tapioca do besides a little flavor? I have always used corn starch as a thickening agent. The tapioca does the same? Please expand. Hi Artie, tapioca is also a thickening agent, But I am no master at baking. You should call mom and ask her why she does it. She would probably get a kick out of that! I also learned an interesting thing this week about cobblers. There are actually two kinds. One, like mine, where the dough is more of an American biscuit type (not a cookie, but a drier dumpling, or bread.) 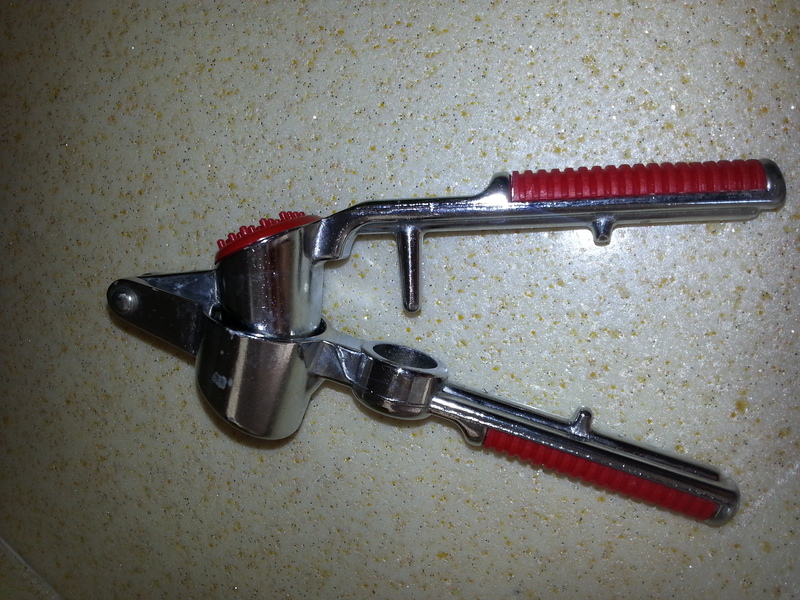 The other uses something like a pie crust, but only on top of the filling. I had never seen or heard of the other until last week. I had to look it up! So glad you’re back to blogging, Terry! And your cobbler looks just mouth-watering!! !